During my 2010 Christmas visit to Australia, my hometown was flooded and a locust plague was immediately followed by a snake plague. At the same time, England was hit by the worst snowfall in over forty years – Heathrow was grounded for days. My arrival this year was marked by a mini cyclone, fires that destroyed thirty homes, a mouse plague and a fatal white shark attack. Two weeks ago, on the day I left New Zealand, a state of emergency was declared because of the worst floods in fifty years. Now I’m in Fiji during monsoon season, a country where cyclones are the norm. Aside from the daily monsoon all is well … but how long is Fiji safe? Optimism and enthusiasm are traits I value; life shouldn’t be wasted indulging in melancholy. Despite this positive view, I’m a magnet for unusual incidents that often turn out to be less than pleasant. Others have noticed the effects on the environment around me (other than those I directly create) and I’ve earned a reputation as a cheerful, apocalyptic catalyst of doom. Each time I merrily trot along for my next endeavour, people suffer. Thankfully, I always emerge from the rubble untouched. Fiji so far has been great: the food delicious, the cocktails superb and the surroundings idyllic … but others at the resort aren’t enjoying themselves quite as much. A man and a couple were sitting at a table near me at breakfast and I overheard their conversation. Female in the couple (hesitant and with a look of concern): Heard from Belinda? Single male (unshaven and weary looking): No, but her sister called and she’s not changing her mind. There’s nothing I can do about it so I’m just going to get on with my holiday … How’s your room? Male in the couple: (happy for the change of subject, I suspect): Bloody hot! The air con doesn’t work, or the tv, or the toilet… this really has been the shittiest holiday we’ve been on. Everything that could possibly go wrong has. (This little ray of sunshine couldn’t be helping his heartbroken friend’s morale). After some hopefully discreet eavesdropping (admittedly, the rest I didn’t accidentally hear …), I discovered that “Belinda” left “Paul” at the resort three days after arriving and called off their engagement. “Amy” and “James” arrived without accommodation and had to stay in a single room together. They all looked disgruntled. My conscience is clear: the blame for their problems isn’t mine. Cyclones, bushfires, floods and plagues I’m happy to take responsibility for – standard natural disasters. But I’m not taking credit for emotional misfortunes and human errors. The ending of relationships on holiday is as common as holiday romances. And disorganisation is self-inflicted (it turned out James hadn’t actually booked a room for the first night of their holiday – he’s probably lucky Amy didn’t do a Belinda on him). My Christmas, spent with newly acquired friends, was unexpectedly enjoyable. And, after days of flooding me with uninvited (though in fairness, very entertaining) poolside conversation, a man from Sydney has invited me to a New Year’s gathering his group are having tomorrow night … is it possible I’ll be seeing in 2012 with the earth moving in a way that doesn’t involve a natural disaster? Or will Mr Sydney soon find himself in a hailstorm, covered in boils and swatting away raining frogs? “RUDEY RUN!! RUDEY RUN!! RUDEY RUN!! RUDEY RUN”!! Naked and running at full speed, both arms held high above her head, my two-year-old niece is circling the living room, into the hallway, through the kitchen and back into the living room. Lap after lap she races, yelling “Rudey run” continuously at the top of her voice. When she enters the living room we get the full volume, then it fades into the distance until seconds later she zooms by for about her twentieth lap. Abruptly she stops, completes a somersault then slowly, and with deliberate intensity, locks eyes with each of her six audience members – her performance is concluded and applause is clearly required. She practically receives a standing ovation. My rudey runs aren’t so positively received. It’s possible that my nightly scampers have been witnessed. This morning, with a less-than-subtle hint, my mother entered my bedroom and opened my wardrobe. Mum: Simone … I put a blue satin dressing-gown in your wardrobe if you need it. Anyone would think my abundant white flesh and unrestrained jigglies aren’t appreciated. Banish the thought. My exhibitionism isn’t shared by my family. The female members are generally more inhibited and I’ve no recollection of seeing any of them naked. My father isn’t quite as shy and I have more memories than I care for of him in the bath, the shower and dashing (with abandoned laughter) for an evening skinny dip in our pool. The memory of shining the garden spotlight on his naked buttocks and watching him run faster (while squealing with panicked delight) is still far funnier than it should be. The apparent unpopularity of my flashing isn’t my only concern. On my travel tours I’ll be sharing rooms and a naked stranger isn’t ever welcomed. The time has come to invest in some sleeping apparel; some piece of constraining, twisting, clinging nightwear. Sigh. I want to be free – free as a two-year-old (except without a nappy, and I’m not sure how I’d feel about a cage around my bed). In darkness, from a wooden boat on a still river, I’m staring up at the walls of a huge cave. Its vast ceiling is covered in thousands of tiny, magical-looking lights. Except they’re not lights … they’re glow worms. An hour earlier, at the entrance to the Waitomo Caves in New Zealand, I’d confessed to another tourist that I’d only recently realised that glow worms were real. He responded, absolutely seriously and somewhat accusatory, “You must have read fairy stories when you were a child though and they had glow worms – what did you think the glow worms in those were then”? (Mentally, I’m sure he added, “What are you, an idiot”?). Hmm … I decided to remain silent about the logic of using fairy tales to prove the existence of something. Our diminutive tour guide proudly informs us that she auditioned for The Hobbit. I think of a friend, an imposing 6’8”, and how constricted he’d feel in these tunnels. On the other hand, my mother (5’1”) and her husband (5’0”) could quite happily set up their own hobbit home in here. The atmosphere is surreal in these murky, ancient surroundings and my imagination quickly embraces a world where hobbits, fairies and giants might exist. Our “Little Guide” (as she calls herself) interrupts my daydreaming. Little Guide: Who knows the name of the parts of the cave that drop down from the roof and the ones that come up from the ground? Mum (without hesitation – she has more than a touch of the Lisa Simpson about her): Stalactites and stalagmites! Little Guide: That’s right. And which one is which? Mum (pauses, unsure of the answer and internally reprimanding herself): Ooh, I’m not entirely sure but I think stalactites drop down from the roof. She’s correct. She always is. Little Guide: The caves have amazing acoustic ability. Would anyone like to sing a song? My mother looks at me and I telepathically plead for her silence; she visibly struggles to restrain herself. Little Guide sings a lilting Maori song and then explains the lifecycle of the glow worm. The scientific details don’t hold my attention – I turn and look in awe at the 24 million year old cave. Absorbed in the wonder of the place, my mind easily drifts. Of Maori descent, my father grew up here – his family farm is three miles away. He and his friends played in these caves (an image that conjures up the movies Stand by Me and Goonies; I’m clearly a child of the eighties). They swam in this river and scared themselves with local stories about spirits who inhabited the place. The fear is entrenched; to this day, he refuses to go underground. My father’s imagination has been passed to me – a blessing and a curse, depending on your viewpoint. In my mind, in this cave, and in this moment, times and worlds are interchangeable – aided by having been in four time zones in nine days, a recent immersion in the unreal and the absence of daylight. In two weeks, I’ve read all four books in the Twilight Saga; the previous night I’d watched Harry Potter and the Philosopher’s Stone; at 3:30 this morning, I’d risen to watch the lunar eclipse. Wizards, goblins, werewolves and vampires are floating through my head as the norm. Harsh light suddenly hits my eyes as we exit the cave and disembark. Abruptly I’m returned to the physical world. Leaving us on the river bank, Little Guide directs the boat away from us back into the tunnel. I want to follow her into the enchanted cave and remain in The Shire with the hobbits. Reality will never be for me. Since writing this, I’ve been to Rotorua’s thermal springs and the breathtaking Huka Falls. I’ve walked through dense forests and by crystal clear rivers – I’ve never seen comparable natural beauty. New Zealand fuels the imagination in a way I hadn’t anticipated. I don’t think I can bear to tell my father he was right about this country … it’s magnificent. A hot December day. Kyabram, Australia. A dark haired, eight-year-old girl dressed in a yellow swimming costume is in her garden, running towards the swimming pool. From the house, her father yells loudly after her, “Remember … don’t touch the sides”!! She knows what this means. The oval-shaped pool is a cheap design; half submerged in the ground, half above ground. To enter it she has to climb a ladder and the sides of the pool are infested with spiders – mostly redbacks. She performs a balancing act on the ladder to enter the water without making contact with the pool’s edge; exiting will be even more acrobatic and at no point during her swim will she go near the border. The year is 1985. …. 26 years later. Bendigo, Australia. In the living room a commercial break interrupts the news. ME: Have you got a key I could use while I’m here? MUM: Sure! The spare key’s in the usual spot in the garage. I remain in my seat. My mother’s tired and I should leap to get the key myself, but I know the garage and I can’t face it yet. Only 24 hours ago we had arrived from the airport. Pulling up to the garage my mother had stopped the car. MUM: “I’ll let you out here and then I’ll pull in”. ME (smiling at our mutual understanding): “Thanks, there’s no need for me to go in there unless I have to”. MUM: “It’s okay if you don’t look up. They never drop down”. (Our family mantra for avoiding spiders. Apparently if you don’t see them, all is well, despite the fact that the ceiling is crawling with them). That night I’d slept sporadically, awake from jetlag. I kept my eyes averted from the window. The room’s spotless and prepared for my stay; fresh linen, polished mirrors, wardrobe space cleared. I know that my mother would have used a broom to clear cobwebs from the window frame and all creepy crawlies would have been ruthlessly destroyed. An unspoken ritual: she knows what must be done. My father, on the other hand, was never so competent when hunting arachnids. We’d spot the creature – by spot I mean scream and run from the room. We’d hear banging and a few obscenities yelled, and then he’d emerge announcing the spider was dead. Inevitably it had escaped and would be seen hours later – dancing gleefully and laughing at us. Our only way around my father’s lie was to demand to see the crumpled corpse; the unity of two sisters fight against the eight-legged is not to be underestimated. 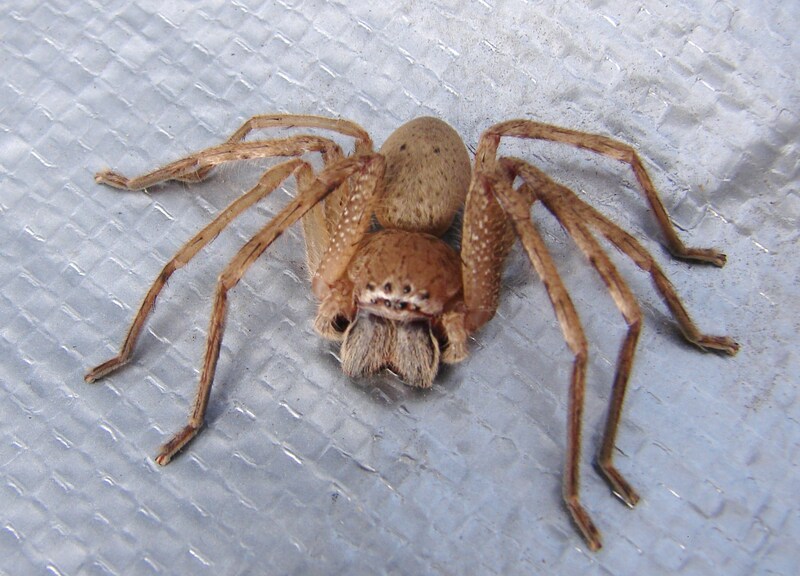 Two species of spider favour our house: redbacks and huntsmans – huntsmans my greater foe. Harmless, but the size of a tarantula, a huntsman is spotted monthly, staring defiantly at us from a large blank wall, never even attempting to hide. In the garage, ostracised by the household, both species (and quite a few more) angrily lurk. It takes stoicism to enter this space and endure the hatred radiating down from countless eyes. Currently, sitting in my mother’s living room, I can’t face it. Of course in a week I’ll have my broom at the ready, the trained child soldier returning, deadened heart and nerves of steel. Australian mercenaries are cultivated early; I’ve witnessed my then-four-year-old niece voluntarily kill with a shoe – that’s a close up, intimate weapon of choice and earned my full admiration. Eventually my mother rises, heading to retrieve the key located in a nook that’s certainly home to Aragog himself. As she stands, I look at her and smile, ”Need a broom”? “No, it’s okay, I just won’t look up”. Since writing this, my mother has informed me that redbacks are far more prevalent in her house than huntsmans – I think this was supposed to be reassuring. Immediately following this conversation, I saw (and drowned) a daddy-long-legs in the bath (in Australia, daddy-long-legs are spiders not insects). It’s going to be a long six months. Tuesday morning, Heathrow, Terminal 3. I’ve boarded my Boeing 747, Flight CX252 to Hong Kong and am walking to my seat. The public sector strikes scheduled for Wednesday mean I’m flying a day early – I can blame them for many things, but not my hangover. Thankfully my throbbing head can relax as my excessive organisation has me fully prepared; I checked in 48 hours ago, chose the perfect seats (aisle for the first leg, window for the second) and, through Cathay Pacific’s website, selected the movies I’ll be watching (Horrible Bosses, Rare Exports: A Christmas Tale, Midnight in Paris and Mr Popper’s Penguins). I’m the only person I know who runs out of time to do all the things they need to do on a long haul flight. I approach my seat and take a (hopefully unnoticeable) intake of breath at the attractive, olive-skinned man in the seat next to mine. We smile hello to each other and I attempt to put my hand luggage in the overhead compartment. He jumps up and grabs my bag. MAN: Let me get that for you (I hear an accent – Dutch?). I thank him, and we seat and buckle ourselves. MAN: So you’re going to Hong Kong? ME: For just a few hours – I’m heading to Australia from there. Polite conversation reveals that he’s German, a dentist, plays the piano, and is an avid motorcyclist. I’ve a history of owning scooters (which prompts mild, good-natured mocking on his part), his name is Wolfgang (which prompts immense, good-natured mocking on mine). He’s on his way to Australia for a friend’s wedding which leads us to indicate that we’re both single, and a distinctly flirtatious atmosphere develops. After we’re fed, the lights are switched off. We draw up our blankets and lower our seats. I wait for about half an hour, my body tense, before pretending to fall asleep. My heart pounds as I feel the back of his left hand lightly brush against my outer right thigh and settle there. Gradually, I feel his hand move more firmly against my leg and gently stroke it (you’ll have to take my word for it when I say this wasn’t creepy). The excitement is intense. Inch by inch, I slowly drop my head to his shoulder, my mouth slightly open (attractiveness had to be sacrificed for authenticity … I’m not saying I’m proud of my actions!). After twenty minutes in this position, a child kicks my seat so I take my opportunity to “wake”. Trying to look dazed, I sit up and lift my head from Wolfgang’s shoulder. MAN: It’s okay … I liked it. ME (my heart jumping at the recognition of our intimacy. I smile): Well I just hope I didn’t dribble on you. MAN: Not at all – I was really enjoying it. I laugh and we both watch our individual movies before landing. Wolfgang asks for my email address (he’s getting a different connecting flight), but I don’t intend to see him again – we had our moment on the flight and it’s best to recognise these for what they are. One friend had a mile high-esque experience with an Italian man and made the mistake of meeting him for dinner – she maintains it was the second worst date of her life. Another friend (male) had a mile high experience (no “esque” about it) on a flight to America and ended up being punched by the woman’s husband, a US soldier. It’s often best to walk away while you’re enjoying yourself and I’m choosing to take my brief moment of titillation. I board the second leg from Hong Kong to Melbourne and see a middle-aged Chinese woman in the seat next to me. This flight will have a very different vibe to the last one. I smile at her and open my book. When we take off I’ll put my headphones on; Mr Popper’s Penguins awaits.